Mary suggested I write this blog post in Italian but I don’t think my Italian is up to that level yet. So the beginners class introduced me to some basic fundamentals like how to do nouns and adjectives both male and female, singular and plural, how to conjugate regular verbs in the present tense and some of the more basic irregular verbs. All good building blocks to start to practice some Italian. I also booked myself three one-on-one conversation lessons with the teachers. Now I’m back I need to revisit the course workbook, repeat the stuff we’ve already covered and do some of the other sections we skipped during the classes. Classes were 9 till 12:30, Monday to Friday. That gave us plenty of time to play the tourist. The school organised a few events so we did a walking tour, a cookery class and a gastronomic walking tour. The walking tour was billed as street art but it was a little more formal than that: an estate where they had decorated various blocks of flats as part of an impressive art project. We also did a couple of self guided walkabouts. The Pantheon panorama pt 1. The Pantheon panorama pt 2. We also took one of the hop-on, hop-off tourist buses. We have done a number of those in other cities and they are a very good way to get an overview of the city and to help orientate yourself. We stayed in an Airbnb apartment less than 10 minutes walk from the school which was very convenient, chosen for that reason. We mostly ate out as the Airbnb apartment had basic cooking facilities. There are an amazing number of pizza joints, café‘s and casual dining establishments in the area. Also some very fine restaurants as well. At Ba Ghetto we had a classic Romano-Jewish dish: carciofi alla giudia. A wine first: Kosher chardonay from Galilee. Rome has two Parkrun venues so we decided to play the Parkrun tourist. The most convenient was Parco Caffarella. We checked it out and the week before there had only been nine runners. We went along and was surprised to discover 60 people were there, most of them visiting Welsh supporters in Rome for the Italy v. Wales rugby match. Later that day at the Italy v. Wales match. Italy lost 15-25: Match report from Sky Sports. We decided to do the same Parkrun the following Saturday as the other Rome Parkrun was more awkward to get to. I have to say that it was a unique experience - it was the first park run I’ve done where we ran round a flock of sheep! At the end of the three weeks we took the train down to Cisternino to check out the apartments and with the plan of signing on with the local GP. Generally renewing is easier than getting into the system for the first time and the idea was to do it before Brexit. As it turns out the annual fee just to be able to sign on was quite substantial so it will be better to pay for a private consultation as and when we need it. After 16 degrees C in Rome it was a bit of a shock to arrive in Cisternino to -1 overnight and daytime highs in the low single digits. 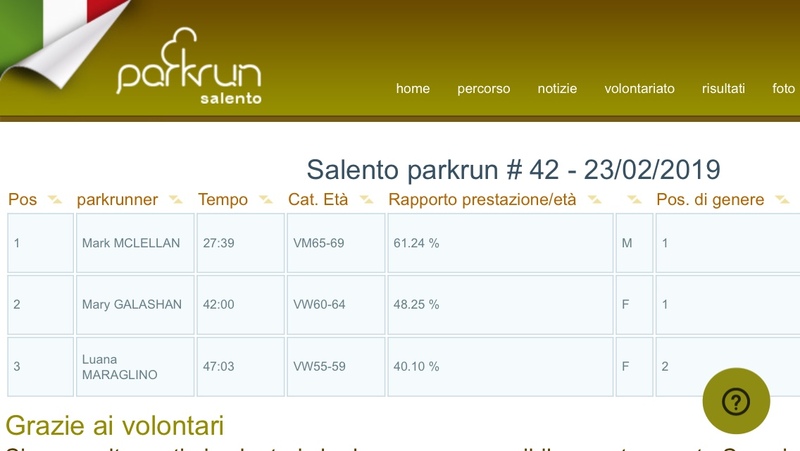 We also made a surprise visit to the Salento Parkrun where Mary and I were the only participants that week so I was able to snag a first past the post! To say it is one man and his dog is the literal truth. Here is the course director, Saverio, and his dog Bea (the Beagle). Mary coming in second place - the fastest woman and the fastest in her age range! However it was not a wasted trip because we got to check out the apartments make sure everything was all okay and meet up with our friends for a very pleasant meal out and a chance for me to practice a little bit my basic Italian.